I’ve been harping on to my girls about needing to tell me what they want for Christmas for months now. I like to be organised well before the day, so the days rolling into Christmas are aimed at keeping my resting heart rate under 160. My girls are 6 & 8 years, & I thought this would be the year my heart would sing with requests of sewing machines & fabrics in all prints & colours. Finally they're at an age where they understand what I do & are even proud as punch to wear Pattern and Cloth clothes. So I started the hints early, that maybe it’s time to teach these young ladies how to sew. I relayed stories of dreaming to make clothes in any colour or fabric you want. I’d teach them & it would be loads of fun. I thought I’d sold the dream, I sure had talked about it enough. My 6 year old was confronted last night at the dinner table. The question was asked, ‘what do you want for Christmas’? My husband & I looking intently waiting for the revelation that would solve all Christmas shopping woes. The anticipation on my part, was bubbling inside, this is where Mother and daughter start their bond of endless stitches only yet to be imagined. And she drops the bomb. ‘I want a whoopee cushion!’ Deflation of the un-whoopee cushion kind leaves my body. A $3 piece of rubber so she can prank her sister. I concede... this year is not going to be the year for sewing machines. I will try again next year. For all of you more serious sewers, or even novice or beginner sewers that want to up their sewing game. I’ve listed my 10 all time best sewing tools I wish I’d bought way back at the start of my sewing journey. Not everything life changing in the sewing world has to be expensive, so there is something for everyones budget. These are a must for all sewers & if you haven’t seen one in the sewing room, then it’s a fantastic gift to give this Christmas. How many small spools of cotton do you have to go through before you ask 'there must be a cheaper way?! These little gadgets are under NZ$20, coupled with a few overlocker/serger spool sized cotton reals & the savings on cotton purchasing will start accumulating. This is definitely my number 1 purchase for a sewing christmas gift. I recommend buying the best shears you can afford so they’ll be enjoyed for many years ahead. After many many pairs of cheap plastic handled sewing scissors, my husband bought me a pair from a clothing factory in China. I haven't sharpened these in over 5 years & they’re a pleasure to cut with each & every time. A beautiful gift that will last a life time if you purchase quality. For the sewer of fine & sheer garments, you can’t go past popping a box of these pins into the Christmas stocking. 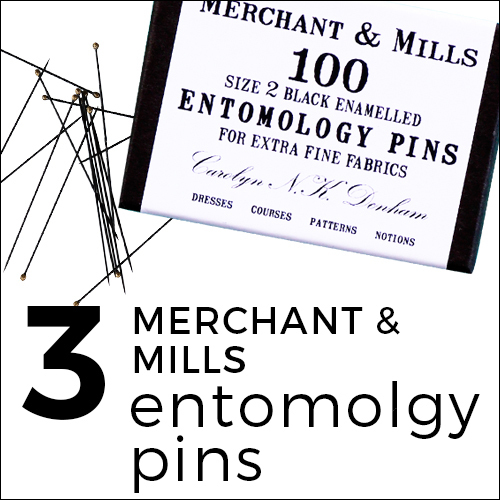 After years of pulled fibres whilst working with silk & satins, a friend told me to give the Merchant & Mills entomology pins a crack. They’re super fine & perfect for pinning away with no pulls. Sewing gifts don’t get much better than an overlocker/serger, especially if the recipient has never owned one before. When it comes to sewing knit fabrics a 4 thread overlocker makes the job super quick & gives a stunning finish. Definitely worth splurging for one of these this Christmas! Looking for a cheap & cheery sewing gift? This little bamboo gem is inexpensive & indispensable once you've had a go with one. Great for pushing out corners to ensure a crisp professional finish. Definitly worth adding to the sewing tool kit. I have to admit, I don't have one of these. I've been using my own handmade cushion for years. Pins are often left all over the place, because I don't aways carry my pin cushion with me back & forth between the iron & the sewing machine. The Bohin pin cushion is on my own Christmas list this year. They look so good, classy & so handy that it goes around your wrist. I love it! A descent pair of snips or small scissors are a fantastic present for a sewer at Christmas. Cheap snips wear blunt with time or the alignment goes out. These Fraliz soft touch scissors from Italy are amazing.... they look gorgeous & not so easy to lose being hot pink. Not all seam rippers are created equal...trust me! The Bernina seam ripper/quick unpick is my go to. I'll drive miles to pick up this particular brand. It's fine & sharp & makes light work of those annoying mistakes. This little gem of an invention is a cracker present for under the tree. Standard chalk pencils often don't stay sharp & markings are often thick & lacking precision. The Clover Chaco Liner Pen is fine & exact in its markings. You can buy different shade refills or gather several pens for different projects & colours. Often found in quilting stores. We all know sewing without a sewing machine is a fate many often us wouldn't consider. If you're looking to give the ultimate sewing gift this year. What about a sewing machine for a wanna be sewer or a machine upgrade for the avid seamstress? I've linked to the sewing machine I use - the Bernina B380. I absolutely love this machine! It has auto button hole programming. For someone that hates & usually avoids sewing button holes, this function makes sewing them perfectly, easy every time. If you're looking for a cute starter machine, you could take a look at this really cool Bernina Bernette Seville. This was the one I wanted to buy for my girls, but alas it's not mean't to be. Never tried a PDF sewing pattern before? You can download our Simple Bib pattern here for free so you can see just how easy it is!